The Sunday Summary is a post I am going to be submitting weekly from now on to let you guys know how I am getting on, what I have been reading throughout the week, tell you about books I have discovered and added to the never ending TBR pile and lastly, what to expect coming up in the following week. Following on from last Sunday I finished Lady of the Rivers by Philippa Gregory on Monday night; the review for this book I posted on Friday and can be found here. If anyone is interested in historical fiction I would highly recommend reading this book, as it gives background to the beginnings of the Wars of the Roses without too much nitty gritty detail. On Tuesday I began reading Extracted by R R Haywood, a science fiction book based on the concept of time travel. I haven’t read any science fiction for a while so this made a refreshing change! I am yet to post the review for this book, but it will be coming your way on Tuesday so keep your eyes out for that if you would like to hear my thoughts. As well as finishing Extracted on Friday night I also started reading the eagerly anticipated Pet Sematary by Stephen King. I can happily hold my hands up and say I have never read anything in the realms of the horror genre before and so far, being approximately half way through the book I am not disappointed. With Stephen King as the author I didn’t think I would be, but you can never be sure until you try. The review for this book will also be published in the near future and I hope you can check it out. I have added a lot of books to the TBR pile this week. It’s no wonder I don’t stand a chance of ever seeing the pile in a manageable state (and preferably less than 100 books – next joke!). I always love a book bargain when I can get one. Eagles in the Storm and Kill the Father were purchased in my local supermarket at two for £7 – which is a really good offer bearing in mind you could easily spend this on one book alone! The best bargain of the week has to be Martina Cole’s The Good Life. My sister is a customer of a UK mobile network that allows customers to buy the book they have on offer every week for £1… yes you read that right! She lets me know what the book is every week and if I’m interested she will get it for me. As it happens, she is visiting this weekend so I managed to get this book quickly. You can tell I’m being a bit of a history geek lately but I’m excited all the same! I figured as well as telling you what I have been doing, it would be nice for you all to know what will be coming up on my blog next week. 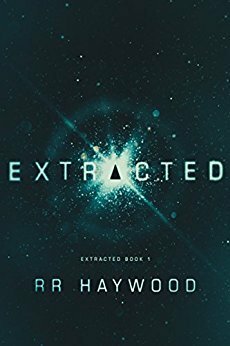 As mentioned above, Tuesday’s post will be a review of Extracted by R R Haywood. I always try to avoid spoilers, so if anyone is concerned about that please be assured I try my hardest not to give anything away. Friday brings to us the start of a new month so I will be publishing my reading list. This month I was too ambitious in adding six books to the list, but as it happens I had to add one to the DNF pile (hopefully only temporarily). Next month I have only added five books to the list to read but if I get ahead of myself and manage to squeeze in another, I’ll keep you posted. Good afternoon folks!! Here’s wishing you all a happy Friday!!! Today I will be giving you my thoughts on the latest read I finished on Monday night (at a time verging on being socially unacceptable given I have to get up at 6:45am the next day) – Lady of the Rivers by Philippa Gregory. I am loving historical fiction at the moment; not only have I read some amazing books of the genre recently… turns out I have been buying quite a few this month too! To name a few, these include The Elizabethan World by Lacey Baldwin Smith, Mayflowers for November by Malyn Bromfield and just last night I treated myself to Eagles in the Storm by Ben Kane. I tell myself repeatedly to chill the f**k out and buy fewer books, but most of the time I see them on offer, and who can refuse a bargain? It’s not like I am buying books I won’t read… so it isn’t a waste of money. That’s what I tell myself anyway! So now I know why Philippa Gregory is a popular historical fiction writer. For me the biggest factor in whether I am going to be able to see a book from one cover to the other is writing style. If I can’t hack the style (Shakespeare and Dickens please accept my sincerest apologies), it’s unlikely I will finish it. Not impossible, but not likely either. I like to read books, not study and analyse them to death. It goes without saying modern books are easier to read in terms of the language and grammar the author uses to tell the story. To take Shakespeare as an example, I do not get iambic pentameter. I can hear it when spoken (David Tennant is amazing at this I might add) but I cannot read it. Shakespearean plays are fantastic theatre – yet somehow I cannot translate the archaic terms into something meaningful unless I can see the emotions unfolding before my eyes, or read the text about six times over with the help of the wonderful internet to tell me what has happened. I far prefer simpler writing styles for reading – especially with books that are taking you into a new timezone, society and culture. Both of my recent reads, River God by Wilbur Smith and Lady of the Rivers achieved this very well. There is no better feeling than getting lost in a book, investing yourself in the characters and hoping for the best for them throughout the conflicts and uncertainties they have to navigate. If the language the book uses is too different from my own, there is a resistance there and I can’t get into it. Equally, some modern language I despise too. If a character was going on about their “feels” for their boyfriend or “spending time with the fam” – I want to punch them for being a lazy s**t for not pronouncing that one extra and evidently taxing syllable. I’m qualified to say this – sadly it is my peers that are using this language. I have digressed. I apologise, but my point is this; this book is neither of these extremes. Lady of the Rivers is narrated from the perspective of Jacquetta, a young woman who navigates through the English court during the conflicts in the Hundred Years war. She is initially married to the Duke of Bedford, uncle to the King, and the marriage is in many ways political. Jacquetta’s heritage is believed to be descendant from a Goddess and the Duke of Bedford wishes to keep her pure and use her powers to foresee the outcome of the war with France. After the Duke of Bedford’s death, Jacquetta longs to be loved and for the closeness of an intimate partner. She falls into the arms of the Duke’s squire, Richard Woodville and marries him in secret, without the King’s permission. They are as good as made destitute having to pay a fine and live purely off the land left to them, but their family thrives. The Woodville’s fortune changes when Jacquetta’s cousin marries King Henry VI. Richard proves himself to be an able soldier and commander; he is sent to France to hold Calais after the loss of Normandy. Henry VI proves to be an overly pious yet inadequate King, unable to make up his own mind about matters of state. As a result, there is much in-fighting between the members of his council who try to persuade him to their way of thinking. A note of personal interest to me was when the Duke of Gloucester and his wife were tried for treason and sorcery against the King. The Duke was executed, the “witch” accused alongside them burnt and the Duke’s wife, having aided these two was imprisoned in Peel Castle on the Isle of Man until her death fourteen years later. Sunsets at Peel Castle are gorgeous to watch – as you can see. Matters at court go from bad to worse as rebellions weaken the position of the King and ultimately the King’s health takes a turn for the worst. Queen Margaret has to take over and there is much resentment at a French woman ruling in Britain. The Duke of York, heir to the throne until the birth of a royal heir is excluded from court and events unravel in such a way that sparks the beginnings of the Wars of the Roses. I read the book to give myself background to start the series spanning the period of the Wars of the Roses and I wasn’t remotely disappointed. The book is written in a remarkably approachable way. It is history – but you don’t get bogged down with facts. Having looked into it, the book is written very well in terms of being historically accurate, but the most important thing is that it is able to be enjoyed and entertaining. I never got the opportunity to learn British history like this at school, which to my mind is utterly stupid. It’s my country’s history. I am grateful that I have the opportunity to learn in other ways than through formal education and I hope there are other people out there of the same opinion as me. Every day is a school day, they say. It’s a little victory I know, but it’s one I’m proud of. When I started this blog, much like other projects I wasn’t sure if I would keep it up or see it through. So far I have, and it is spurring me on more than ever to keep up with my reading challenge and to keep writing on a regular basis. The worst day of the week is over and at least for us Brits… next Monday is a bank holiday, so we have that to look forward to! A fun little fact for anybody interested, which is timely given that I am currently starting a book series based on this snippet of our history – today marks the anniversary of the Battle of Bosworth Field, being the last of the battles of the Wars of the Roses. I looked forward to this when I first added it to the list. I suppose it is a little different in terms of plot line but equally clichéd in that the main focus is a character that has more power than she should or anyone else has seen before. That’s not to say that I wouldn’t ever read anything like this, but I’ve lost the enthusiasm I had for it. It will be nice to break away from the cliché. I have had the perfect intention to read this book for a number of years. I’m sure on the sly I tried to read the first chapter in a bookshop once whilst “browsing” to see if I liked it. If any book lover claims they haven’t done this – I am straight up calling you out as a liar. It must be one of the only forms of window shopping that takes any longer than a couple of minutes!! I love Brandon Sanderson. Only the other day was one of my good friends, also a lover of the fantasy genre endorsing this series to me as it was one of her favourites. Sanderson is an amazing fantasy author and I love the Mistborn series. (Thus far I have only read the initial trilogy but I will be reading the later books before too long). The thing I loved most about this series was that whilst it contained magic, it had a physical element to it. It wasn’t spells or just “in the air”. It was a physical source of power present in specific pure metals that only a few people could use. I found it a refreshing change. Books that involve war are always a plus for me… who doesn’t love a bit of conflict. I’m not sadistic… I promise!! So the plot of this book initially sounds interesting, if not very familiar (yet another teenage orphan boy… yay). He is imprisoned for a crime he doesn’t commit, however his cellmate takes him under his wing and from there on they go on their winding and mystical adventure. Whilst the synopsis doesn’t make a point of this, all of the reviews talk about the characters and their relationship with one another. Turns out this book is within the circles of the LGBT genre. If I had known that, I wouldn’t have added this book to the list. Please hear me out. Do not think me judgemental towards a minority group that has experienced a lot of prejudice over the years; the fact is, I don’t like romance. Full stop. Point blank. Obviously relationships are all around us and done subtly, that’s okay. I find reading about them in very specific detail just makes me uncomfortable. I don’t like it. Sorry. I wouldn’t read this book just as I wouldn’t read Fifty Shades of Grey. Give me a book with any form of political intrigue and I’ll be as happy as a pig in … I’m sure you know the expression. Initially the plot of unraveling a crime doesn’t jump out at me, but if well done this could prove to be a great book. I love plot twists, hidden turns and sometimes the more subtlety employed to achieve this, the better. This has great potential – so it definitely has to stay on the TBR. I also note that it has received a number of awards since it’s release in 2014, which is a fantastic achievement. So there you have it folks! If you have made it all the way down here then thank you for reading the ramble. My next post will be a review of Lady of the Rivers, which I am finally getting around to finishing! A Discworld Novel. It’s a hot Midsummer Night. The crop circles are turning up everywhere-even on the mustard-and-cress of Pewseyy Ogg, aged four. And Magrat Garlick, witch, is going to be married in the morning…Everything ought to be going like a dream. But the Lancre All-Comers Morris Team have got drunk on a fairy mound and the elves have come back, bringing all those things traditionally associated with the magical, glittering realm of Faerie: cruelty, kidnapping, malice and evil, evil murder. * Granny Weatherwax and her tiny argumentative coven have really got their work cut out this time…With full supporting cast of dwarfs, wizards, trolls, Morris Dancers and one orang-utan. And lots. of hey-nonny-nonny and blood all over the place. *But with tons of style. Granny Weatherwax, Gytha Ogg and Magrat Garlick get up to their usual tricks and meddling interference once again!! I absolutely love these characters; if anybody else has grown up with strong matriarch’s in the family, you will relate to these women one way or another. This is the first Discworld book I have come across so far that follows on from events in a previous book (so, therefore, it is helpful to have read the prior book). Usually, they are all independent with common themes. Note I say helpful as opposed to essential. So Magrat is getting married…. Little, hopeless, lanky, simplistic and typically teenage outcast Magrat is marrying the King of Lancre, no less. Fear not, ladies who prefer to trawl some of the lesser pages of the internet in favour of either finding a man or spending time with the one sat on the couch next to you!! Miracles happen for us all! At least on the Discworld they do, and let’s face it, ANYTHING can happen on the Discworld. And of course who is responsible for the marriage proposal? Well, A N Other witch might be involved. Just imagine the postcards sent home after that trip. You’d suspect someone had been on the wacky-baccy. After Prince Verence is kidnapped Magrat goes to her soon-to-be husband’s rescue, dressed in all bits and bobs of ill-fitting armour and her wedding dress underneath. As you do. The witches have their different and contradictory ideas as to how to rid Lancre of this new threat but can they pull together in the time of greatest need? You’ll have to read the book and find out. I’m not all for spoilers. This book was as funny as I expected it to be; Pratchett has an obscure sense of humour at times and although I found it a little difficult to appreciate at first, the Discworld series of books has to be up there among my favourites. That said, I don’t love each and every one of them individually, and with Lords and Ladies in particular, it isn’t my favourite book featuring the witches. It’s still enjoyable, and the characters live up to their good selves, but I prefer some of the other story lines better. There are good elements in all of them, but some of them have more. If anyone is interested, my current favourite book featuring the witches’ antics on the Discworld is Witches Abroad, the review for which can be found here: Review: Witches Abroad – Terry Pratchett. My love of these characters pretty much derives from the fact that I can relate to a lot of their personalities and attitudes as they mirror those in my mother’s side of the family. I very much grew up being told, “do as I say and not as I do”, which is exactly what the witches are like. To them, the rules are there for a reason: to be broken. I originally started this tag about two weeks ago, when I decided that I needed to both spring clean and consolidate my reading lists into one. For anybody interested, please find a link back to my first post with acknowledgements of origins of the tag here. So getting straight down to business, here are the next five books on my TBR! It’s just some obscure names and places. You’re used to it. It involves magic and rebellion… so that’s a good start. But, gooey romance gone wrong… hmmm not sure about that. (Sorry folks, I’m a die hard realist when it comes to all this one-true-love crap). *re-reads synopsis properly* Okay so that doesn’t sound so bad second time round. Plus friends X & Y have read it and rated it at least four stars. And it’s his debut novel. Well I can’t not read it now. I love Brandon Sanderson and in particular the Mistborn series, so there is no real reason I won’t like this. Goodreads, your synopsis is too long and detailed, but I’ll put up with it just this once! I have a bit of a soft spot in me for books that involve Gods and their interventions in human life. It probably derives as part of my sense of humour, because truthfully I’m a firm athiest. I also love Terry Pratchett’s concept of the Gods playing their games, rolling the dice and that the Discworld is the stage upon which the great game is played. If this isn’t an excellent foundation, I don’t know what is. I have heard a lot of praise for this series, and it is this that is persuading me to give this book a chance more so than the synopsis. My friends X & Y (the same as above) have also marked this to-read so we quite clearly have a similar taste in books. I trust their judgement. I was also fortunate to have found the kindle edition of this book reduced in price not so long ago, so I took the plunge to buy it there and then. I guess I am going to be reading it after all!! I’ve lost my enthusiasm for this series. I read the first two books whilst still at school, in the first year of sixth form if memory serves. I distinctly remember having to supervise younger students and whittling away the minutes of boredom, propped up against the radiator reading Eragon. I find the writing style of these books to be for a younger audience and for me that makes them less enjoyable. I apologise, but I’m going to have to drop these off my list. If anybody else would like to take part in this tag, please do! Comment below a link to your post so I can check it out!! The most harrowing thing that stuck with me when reading this book was how easily women in society were downgraded to nothing but merely possessions. Not only that, but the vivid detail with how it was done resonated with me because truthfully, the very same thing could be done now if the right lunatic came along. There would be nothing we could do to stop it. That isn’t to say I think it will happen; I don’t. We may have a colourful history when it comes to the royalty and presidents that have made their mark on the world, but I doubt things would ever get this far. I have to, for the sake of my sanity. The whole story is written from the perspective of Offred, a handmaid who tried to flee with her husband and daughter but regrettably got captured when they tried to escape and they were separated. The roles of handmaid’s were created in order to re-populate Gilead after a disaster that affected many people. As a result of the exposure to toxins in water infertility afflicted many men and women (though of course you can’t say that about men since they are superior – duh!) Other effects are not immediately present. Some of the remaining fertile women give birth to babies that are unbabies – that is to say that the exposure to toxins in water after said disaster has made mutations common. I also want to add at this point that it isn’t purely women that are oppressed in this “modern” society – a lot of men are denied access to a handmaid unless they are of sufficient rank and are therefore denied a family. Many of you may know that Channel 4 has recently being showing a ten part series in the UK based on the book. As of writing this, I am yet to watch the last episode, because I wanted to finish the book first. To make everybody aware, the TV series is a more embellished version of the book. Some plot lines are exaggerated and some are made up to add to the story. The order of things has also been mixed up. For example, in the book Offred does not attend a salvaging until pretty much right at the end of the book, whereas it happens much earlier on in the series. These little things are slight annoyances to me. Don’t get me wrong; I know they have done it to make things interesting, current and appeal to a wider audience… I get that. I don’t have to like it though. I think it’s fair to say that despite their differences, they are both enjoyable. It is best to appreciate them separately. Let’s not forget that A Handmaid’s Tale was first published in 1985 and there are a lot of differences between society and the readership then and us now. To take one example from the TV series, Ofglen (the original one – the handmaid’s names are based on their “masters”) had a girlfriend back before she was captured and trained to be a handmaid. For conspiring against the society that enslaves her, Ofglen is forced to watch her girlfriend (who is not fertile and therefore expendable) hanged to death. Given that this year marks the 50th anniversary of the decriminalisation of homosexuality, this is a relevant topic today. I acknowledge at this point it was technically only illegal for men, but as the series is based for the most part around the oppression of women in times where human fertility is dangerously low, you have to work with what you’ve got. This story line wasn’t in the book at all. Ofglen conspired all right, but after she was found out she disappeared entirely, never to be seen again. It is fair to say that this book is an acquired taste to read… you are either interested in the subject, or you’re not. I tried to read this a couple of years ago, got about a third of the way through and gave up. I hate leaving books unread, but I hate forcing myself through them more – I won’t enjoy it as there is little point. Watching the TV series helped for me. If anyone has watched it and is curious about the book I would recommend giving it a read too. As I said above, there are subtle differences so it’s worth checking out! Have any of you watched the series or read the book? What did you make of them? I’d love to hear your thoughts! A Clockwork Orange is written from the perspective of Alex, a teen who spends his time away from school by terrorising the local neighbourhood. It’s safe to say, he’s a bad egg. When he isn’t doing that, he is usually in his room deep in the peaceful abyss of classical music. He narrates his tale in the language that he uses when with his crew and fellow teens of the book; it is a confusing form of slang with Russian being a heavy influence. Our pockets were full of deng, so there was no real need from the point of view of crasting any more pretty polly to tolchock some old veck in an alley and viddy him swim in his blood while we counted the takings and divided by four, nor to do the ultra-violent on some shivering starry grey haired ptitsa in a shop and go smecking off with the till’s guts. But, as they say, money isn’t everything. If you are anything like me, you would probably have been scratching your head at this point, but as you read on you begin to work out the meaning of the obscure words. Some are less obvious than others, trust me. The above caption from the book should give you an idea of the attitude of the teens, and the older characters of the book we meet indicate that this attitude is wide-spread. A lot of people fear to walk the streets at night, frightened of each of the gang leaders and their “droogs” (that’s friends, to you and I). Those who don’t fear the streets will wish they hadn’t ventured out. When we meet Alex it is apparent he is already a person of interest by social services, and much as the title foreshadows, he always ends up on the same path of crime and anti-social behaviour. The law catches up with Alex when he becomes responsible for the death of an elderly woman, and as a result he is sentenced to fourteen years in prison. After two years he kills a cell mate who tries to get too “friendly” with him – I find it ironic that as a person he would think nothing of such behaviour if it were him committing the act, but it being done to himself is an entirely different story. I have digressed; after this Alex is put forward for a program designed to reform individuals like him in as little as two weeks. This ultimately becomes a highly controversial method of treatment as Alex, being “reformed” (or mentally scarred through a cruel form of torture if you ask me) is released back into the new world. He struggles to adapt to his new life, feels rejected by his parents and is no longer able to love classical music as a result of the “treatment” he received. Much again in line with the concept of clockwork, once out he finds himself subjected to beatings from the police and subjected to being treated as if he is on the bottom rung of society. He ultimately attempts to commit suicide. Whilst he doesn’t succeed in this he frees himself of the conditioning of his mind – he can listen to classical music and his thoughts venture into the desire to commit violent acts again. Does this make him “normal” again? Who can say definitively. There is wrong and there is right, but equally there are so many shades of grey in between, and that is where we all find ourselves… somewhere between the goal posts of the “holy saint” and “spawn of the devil”. The book is an interesting read in that it highlights a number of issues in the justice system. Whilst ethically no treatment like Alex endured could be practiced now, it raises questions as to how far we can go in order to guide people to behave in a manner defined be society as acceptable. At the end of the book Alex raises the point as to what he could do were his son to behave in the same way, and his son after him etc… like clockwork. Sadly, it is equally apparent that society shuns these individuals regardless of reform or punishment just as rigidly.